A generous friend just sent me one of Nina Ottoson’s interactive dog toys, and Will and I have been having a great time playing with them. Well, he plays, I watch. And, I think he is having a great time. And that’s the question for the day. Is he really? Do dogs enjoy these toys as much as we like watching them? I did give Willie a clue, I nudged the knob a bit in another direction, and although I doubt that he was imitating my action (something that is actually a complex cognitive process… that’s a blog topic unto itself) he went back to nudging and pawing and finally got the food treat. After 5 sessions he is a whiz at it. He’s got the nudge and paw down pat, and although I don’t think he can use the shape of the slot that the knob moves within to figure out which way to move the knob, he seems to know right away that he should change the direction of his nudge if the knob stops moving. And now, his face looks relaxed and excited. Once he’s cleared the board, his face rises, as if coming up for air, with an open mouth, shiny eyes and relaxed facial muscles. So here’s the question: How much of “working for food” is fun for dogs, how much is just frustrating? Here’s some speculation on my part. Trying to solve a problem can be frustrating, but a limited amount of frustration isn’t necessarily a bad thing. I think Will’s brief moments of frustration while he was trying to figure out the puzzle were actually good mental exercise and a good learning process. However, if the problem was too hard to solve, then I suspect that frustration can become aversive enough to be problematic. In the case of this particular toy, I think the mental exercise was truly good for him in the long run. And what does he think of it now? Is it “Oh boy, here comes fun?” or… “Why the #&(*^%$ doesn’t she just give me the #@%&*% food? Your thoughts? I’d love to hear them. Meanwhile, back on the farm: There has been a huge change in the world around us all: the weather is profoundly different. Besides being still light at 5:45 (5:45! Amazing! ), there’s still lots of snow on the ground, but the temperature is over freezing every day, high 30’s and low 40’s and it feels balmy and so very very much like early spring. The Chickadees and Blue Jays are singing, the woodpeckers are drumming, the Red Tail Hawks have already laid eggs and are settled over them, belly feathers spread over the oval eggs, somewhere high in the oaks across the road. We’re all starting to talk about “mud season,” the 5th season anywhere with snowy winters. Once it continues to warm, the snow melts, the upper layer of the ground melts, but the soil below stays frozen for awhile, leading to deep, soggy lakes of brown muck that sticks like glue to your boots and covers your kitchen floor, no matter how many times you towel off your dog’s paws. Shearing the sheep was postponed, my shearer got a job after being laid off for a year, so who could do anyting but cheer him on? He’ll be here next Saturday. I’m anxious to see the sheep without their coat of wool; it’s hard to judge their condition until they are shorn. But, sigh, they’ll still be fat, and not just because they are pregnant. We’re all a tad overweight here, but it’s a lot easier to regulate their diet than my own. They are eating the bark off my apple trees now (don’t worry, they are getting super rich hay and supplements–they really aren’t starving), but, alas, I couldn’t resist the chocolate chip cookie that Jim brought home last night. Maybe I could develop a taste for tree bark? Trisha, now that Willie is a pro, does he approach the puzzle with the same enthusiasm time after time? In other words, do you think he will ever tire of the game and think it is too easy? Or maybe it will always keep his interest as he views it as an easy way to get yummy treats? I adopted Zoe at about 5 months of age and fed her mostly in puzzle toys from the start (the exception being homemade goods). It’s her norm, and it quickly became such for the more recent addition (Annie) as well. I don’t see the toys as frustrating to either dog, but I’m going to elaborate nonetheless. I know it isn’t behavior many like to encourage, but Zoe brings me her puzzle toys when she thinks I’ve put off a meal for too long. She’ll bring me a puzzle toy and drop it in my lap. I’ll place the toy on the floor, and she immediately hands it to me again. If I put it aside, she’ll bring me another puzzle toy. I don’t mind. She holds me accountable! 🙂 Both of my dogs put on their happy faces when they see me pick up one of the puzzle toys. I know it’s the food rather than the toys, but they obviously don’t consider the process too distressing. Almost all of the toys (I have a collection!) were rather easy for both dogs from the start. Lastly, I tried the puzzle toys out on the dog I grew up with shortly before his recent death. He was a 15-year-old, newly deaf Labrador mix with hip dysplasia, but even he enjoyed a good Kong or go at the Tornado. I have never used one of those food puzzle toys with my dogs. Looks interesting. When the weather is bad, sometimes instead of bundling up and going for a walk, I will play shaping games with my dogs as they work for their dinners. I try not to go too long without clicking, and if I find that I am, I adjust my expectations of what I am trying to shape to try to give my dog more opportunities to succeed. If Copper get’s frustrated, he will just sit down and look at me like, “ok mom, I need a hint here” whereas Izzy will get a bit frantic and start barking (we call that “swearing”). They both get extremely excited when I get out the clicker, and they look happy as they are offering behaviors, so I think that they enjoy it. I found that working for her dinner was an extremely powerful training tool when I was working on Izzy’s reactivity and in general improved our relationship a lot. One thing I have really enjoyed with the shaping is seeing how my two dogs think about problem solving very differently. Copper is more biddable and learns a trick with fewer repetitions, but Izzy is the better independent problem solver. An example that really made me laugh was when I was introducing a single agility jump via shaping, clicking the dog for successfully offering a jump over the bar without knocking it down. The jump was near a wall, I was sitting on the floor next to the jump, and a bed was behind me so there was no room to go around. Copper hopped back and forth without concern, but at a certain height I think that the jump started to look a little bit scary to Izzy. She hesitated for a moment, then jumped over the bed and hopped down to the far side of the jump. Then she looked at me expectantly “Mom, technically I AM on the other side of the jump!” and then barked at me in frustration when she didn’t get a treat. I imagine that the familiar guest bed that she jumps on all the time, was much less scary than the new agility jump, and despite it being more work, she used it to do what she thought I wanted – get to the OTHER SIDE of the jump. Copper on the other hand seemed to make the connection that what was awarding him the treat was going OVER the jump and never tried just walking to the other side even when the opportunity was available. I’d love if you’d write more about dogs learning through observation or imitation. There have been two times where my dog seemed to figure out what I wanted after I demonstrated it for her. The first was the tug-a-jug. She spent about twenty minutes at it until I showed her how it worked… then she never looked back. The second was when I was try to teach her to push a kiddie play tunnel with her nose. She kept touching it, but didn’t push with enough force to make it roll. I pushed the tunnel so that it rolled, clicked and treated her, and then she did it! Coincidence? Maybe. – There is no question that if there was not a treat inside, under, or behind each peg or brick, she would walk away from the puzzle. No hidden treat = no playing along. – When learning a new puzzle, she becomes clearly frustrated and at times, the potential of a treat does not seem worth the continued effort. If I won’t give her a small clue at times, she would rather walk away and give up then try again for the treat. – While mastering a new puzzle (i.e. the light bulb has gone off, but there is still some confusion about exactly how things work), her body is at it’s happiest…tail wagging, working quickly, eyes bright, loose mouth, lots of energy with what appears to be independent thinking or a lack of interest in me…kind of like “I think I got this, I don’t need your help”. At this stage, the treat almost seems like a bonus…which I realize is my interpretation, but hey, it’s all I’ve got. 1) It has made my dog much more capable of solving problems on her own. By working this part of her brain, it has added a level of mental capability that she hadn’t exhibited before. 2) I am in awe of how much complex thinking a dog’s brain can do. We use Nina’s puzzles in Animal Assisted Therapy with mild stroke victims and children with mild Cerebral Palsy and it’s interesting to see that my dog has solved some of the puzzles faster than my human clients can…and that’s with me verbally explaining to the humans how the puzzles work. And these are not people that have learning disabilities, they are mainly focused on re-wiring their brain to their muscles. 3) All my dog wants to do is eat all the time and her physical limitations make exercise difficult. If I didn’t have some options for her to work for her food, she would be miserably bored and/or jabba the hut. And while a frustrated dog is not a happy dog, a bored dog is not happy either. I’m sure if I could ask my dog “would you rather just have the treats or solve the puzzle first”, she would jump at the treats…but then 30 seconds later she would be wanting more treats and still be bored. I’m sure most of us humans are the same. If someone asked us if we would like to skip all that “working” stuff and just get a paycheck, we would say yes. But it’s all the “working” stuff, good and bad, that makes our lives rich and complete…despite the frustration we endure in the process. My standard poodle loves games and is especially fond of “smell it, find it.” I’ve never noticed any frustration in his play. Maybe I need to find a more challenging toy. It’s just as good to work their brains as their muscles. I have the Dog Fighter too and in my case, I was the one frustrated because it took so little time for my dogs to figure it out! It took them a few session to really master it, but they were able to lift the knobs already after a few minutes in the first session. And they seem happily excited when they see me loading it. One of them, the BC, is generally the type of dog to stop and ask for help (guess that’s common to most BCs?). The aussie LOVES solving problems and is rarely frustrated. LOL – I feed my dog almost all of her meals from various puzzle toys, and I’ve had the same thoughts. She seems very enthusiastic and excited to play with them and eat, but I wonder if she ever thinks, “Why are you filling that thing up when you could just dump it in the bowl?? ?” In her case, her enjoyment seems to outweigh her frustration. Her frustration seems to be more a temporary challenge – like getting to a really hard bit in a sudoku, or a crossword puzzle clue that just isn’t making sense. You become annoyed and frustrated and mutter under your breath (or in her case, chomp the toy as hard as possible and/or throw it at the ground and/or walk away for a minute to sniff around for easier prospects), but then you’re even happier when you finally do succeed. It’s a bigger sense of accomplishment than solving something very easy. I can’t say for sure that she feels “a sense of accomplishment”, of course, but I have seen her smile and wag her tail “to herself” when she finally extracts a tricky morsel from a kong. In Willie’s case (and in Ruly’s under similar circumstances – I’ve also occasionally had to gently discourage non-regulation strategies with Ottoson toys and others!) I wonder if part of the more intense frustration was that he was being blocked from even attempting what seemed like a very promising approach – when in doubt, chew it out! 😀 “OK, human, if you don’t want me to do the obvious thing and use my teeth, then what DO you want?? ?” I am very lucky that my dog is “soft” enough to respond readily to suggestions, but resilient and persistent enough that being redirected doesn’t cause her to shut down or stop trying. She will pause to try to figure out what I mean, then (tentatively at first, watching to see if it’s OK, then more enthusiastically as I give feedback) try something else. I’m very lucky in general, actually. Today it has been 1 year since I brought home The Best Dog In The World! 😉 And now I feel I must go play with her instead of talking about her on the internet….. Thanks for this topic. I’m currently training my second agility dog — age almost 3. And the question “Why are you, dog, doing this?” facinates to me. There are food rewards involved. And there are toy rewards involves. Verbal and phyical touch rewards are used. And there is the reward of playing with me — running the course. 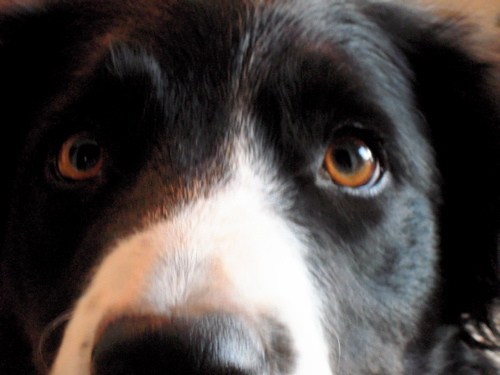 There are also plenty of frustrations for the dog in all stages of learning agility. Learning the obstacles; learning to preform the obstacles; learing to perform the obstacles in different order and from different angles and distances; learning to perform the obstacles with me in different positions; learning my signals for completing the course; learning my signals in relation to the obstacles. It goes on. None of this comes the first time or without multiple practice repititions. While I’ve trained only two agility dogs, I’ve watched many dogs be trained and run. My sense of the dog’s perspective is that the game becomes a huge part of the reward, especially as the dog becomes more advanced in its training. True, random food and toys are used in training. But the interval between the reward increases with the training level. And yet the dog lines up with shining eyes and a wagging tail to run with me every time. Of coure there is always a postitive word and touch reward for my dog in the training. But I’ve never found those two reinforcements to be the ultimate pay off for a dog in other settings. An encouragement, yes, but not necessarily the dog’s idea of bonus at the end of the well-done behavior. But they can be in agility. I also think that there is a huge component of playing-with-my-person in agility that is reinforcing to the dog. (When the toy was Willie’s alone to manipulate, his frustration might be harder for him to handle? When you started manipulating the toy, no matter how slightly, he showed more interest? Is there a level of reinforcement that is your involvement, that is playing-with-my- human? His continued effort is ultimately reinforced with the food?) My dogs can be on my backyard agility course and will not do the obstacles (except for the tunnel and table) if I’m not out there. However, as soon as I appear, they start offering obstacle performance as if to say, “Do you like this? What about this? Is this it?” My thought is that playing the game with me is the primary reinforcement. The bonus of food, toys, voice, and touch reward continued effort. And if we’re looking for another spin-off topic, here’s one. I am of the belief that one cannot train an agility dog with a heavy hand. Positive reinforcement is the best, and possibly only, way to get dog to play the agility game with you. Certainly if the ultimate goal is having a dog run successfully in competition. I look forward to hearing what others think. I love the Will photos. And as for the fat sheep, the ewes will probably lose that as the lambs arrive and begin nursing. But I’m sure you already know that. I think there are dogs that enjoy puzzles, and dogs that don’t. I have some of both. The ones who enjoy them are the ones who figure it out without a tremendous amount of frustration. When they sit back and obviously aren’t getting it….that’s too much frustration I think. Fascinating topic, Trisha – I have been looking at the Ottosson toys, and wondering if my dogs would enjoy them. I have also experienced that “just give me the treat!” look – especially when trying to persuade Sophy the papillon that jumping over a stick set six inches off the ground was easy-peasy. She demonstrated 10 different ways of reaching my side without jumping over it – most of which involved clambering over furniture with a lot more effort than a simple jump. Four inches yes – six inches no. Then there was a knock at the door and she flew over it to greet the postman! Poppy the poodle, meanwhile, is happy to jump backwards and forwards any number of times, and once she is old enough for me to encourage her will probably throw a few back flips in for the hell of it, but that is the difference between my papillon and my poodle. Sophy seems to worry about getting things right first time – Poppy keeps flinging behaviours around until one hits the jack pot. I’m not aware of raising them very differently, but suspect some of it must be down to nurture. Perhaps Sophy, as an only dog for the first 9 months, got used to having me solve too many of her problems for her? Or perhaps Poppy is simply benefitting from growing up with a slightly more experienced owner! It is getting Springlike here in Northern England. There is still some snow on the hills, but we have well-grown lambs out in the fields with their Mums (I was interested to read that you shear so early – round here it is done in early summer), and the tree buds are all on the verge of bursting. We’ve had some lovely sunny days – so there are now dire mutterings about March coming in like a lamb and out like a lion. Cast ne’er a clout till May be out, and all that! I got my dog the small genie bottle made by Canine Genius. She caught on immediately – pawing, rolling, bouncing it until the food fell out. Fun! I started putting her morning kibble inside with a peanut butter “plug” and a biscuit inside for a challenge, on days when I had go to work, figuring she would be entertained for at least fifteen minutes. When the first bottle disappeared after a couple of weeks, I chalked it up to bad housekeeping on my part – must be in the house somewhere, but what the heck – since she had enjoyed it so much, I just went ahead and shelled out big bucks for the bigger version. When THAT one vanished, I looked EVERYWHERE: in the house, in the (large) pen, in the (very large) fenced yard. My dog certainly wasn’t “frustrated” by a puzzle-toy, but she apparently saw no valid reason to stretch breakfast out to more than 45 seconds! So she very kindly tucked the toys away out of sight, rather than disappoint the Human. I wondered about the “why don’t you just give me the %^$ food” as well. Then one day we came home from being out all day, all feeling very tired and I just didn’t feel like putting Daisy’s meal in a kibble dispensing toy. I figured she’d appreciate the break, too – so I put her food in a bowl and gave it to her. She looked at the food, looked at me, sat – and repeated the sequence several times until I smartened up and put it in a %^& dispensing toy already. She’s a shy dog and is very strict on routine, and whether it was because this was a break in routine I don’t know, but she certainly wanted things done the right way. Of my two permanent dogs, the old guy has always been a slow eater, and now is severely slow. He does get his meals in his bowl. Re: boredom with Ottoson toys. Would dogs who have mastered the Ottosons find renewed interest if there were not treats in all the slots? On the theory of slot machines where you have to keep trying for a payoff? I suppose they could sniff which cups held the treats, but maybe you could fake them out by rubbing liver in the empty cups. My Old Pup isn’t much for puzzle toys. We tried a Kong and a Busy Buddy, and she ate whatever food she could get easily and then abandoned it. Haven’t tried too much beyond some of the basic kong-type puzzle toys, but my Akita definitely doesn’t seem to have the “enjoy it” aspect as much. I still do it just because it keeps her busy for a while, but she’s very workmanlike in the way she uses it. “Toss toy. Check if food fell out. Pick it up. Repeat.” I think some of her problem could be the type of toys she has so far – they tend to be “chew hard to get something out” toys whereas chewing is never her solution to anything – picking it up and throwing it against something is. She gets a little obsessive about the harder ones, and will not leave the toy alone until it is out, even if it takes an hour for her to essentially slobber enough to soften the biscuit to make it fall out, but I don’t know she’s enjoying it. I just sort of assume that she enjoys it better than having nothing to do in her create for an hour. She reacts somewhat similarly to any new “game” that involves treats, though. She’ll almost play fetch naturally, and will most enthusiastically play “run after the ball, then catch it and throw it and dribble it (she literally dribbles it like it’s a basketball)”, but the moment I tried to introduce a treat or second toy reward, she does the bare minimum that might possibly get a treat and stops even trying to play the game. Once there’s a reward involved she is all business. I have the Dog Smart (where the dog takes out little cones to get to the treats) and the Tornado (where he has to push the bricks) from Nina Ottoson toys, and I think my dogs enjoy them. Flakes, the Australian Shepherd even rips out the cones when there is nothing underneath (silly me, trying to indicate the one that actually HAS a treat underneath, which he finds, but then goes on) and throws them around, looking very pleased. Benni, a little Terrier cannot really take them out by himself, so he indicates by placing his paw on the one he wants me to move. I have even watched them working as a team once; Flakes taking out the cones, Benni eating the treats (something they also sometimes do with treat balls, since Flakes is not very motivated in some food items but loves the movement of the toy and Benni gives up easily if he does not get the treats out at once). I tried a Tricky Treat Ball with my Brittany, Mick. Initially it seemed really fun for him, but as he removed more food it got harder to get food out of it, and he started whining and throwing me the “oi, a little help here!“ look at me. I only tried it a few times (though I`ve been meaning to get it out again), but he invariably seemed stressed towards the end, and I always end up helping him. Personality-wise he`s very intense when he decides that he`s “working“, and the treat ball definitely ends up being work. That, and it`s a pain in the rear `cause it always gets stuck under our couch! Does Will play with it without the treat? I love the stories about the dogs that use the toys to indicate it is time to eat; like the dog that brings his bowl to the human. Garrett (The Brain Surgeon) got Dog Fighter (I agree – strange name) for Christmas. First time out, it took him 10 minutes to figure it out. I have no doubt that he enjoys it for what it is, a fun and stimulating game. He continues to solve the puzzle with enthusiasm whenever I get it out. He tends to approach life that way and is generous enough to not lose patience with those who don’t “get it” immediately, like me. My challenge is to come up with new and interesting ways for him to play with his current toys. I mean, I love him, but I’m not about to spoil him with a constant parade of new toys. He doesn’t seem to mind and even occasionally comes up with new rules for old games. His latest is finding a toy by name in a place by name. No points for bring me anything else from anywhere else. I do buy him a new toy once in a while to restock his library, which I buy (plus his treats) at the local humane society’s retail shop. They’re more than happy to get me coming-and-going by also accepting donations, i.e., I buy stuff at their shop and then turn around and donate it to the shelter animals. I urge everyone to do the same; it’s a great way to contribute! P.S. Garrett also enjoys playing the with Ottoson puzzles for a while whether there are treats or not. Of course, I don’t expect him to do that for more than a few minutes. I don’t want to find out what he’ll think of doing on his own! @ Barb – I agree 110%, you cannot train agility with a heavy, or even a stern hand. It is, at it’s heart, about your dog learning to love playing agility with his person and vice versa. Dogs seem to me to love ritualized games, and I think the whole agility routine taps into that. Also, I often think that if my dogs could talk when we go for a walk, they would ask me why the heck I am so slow – I think part of what makes agility fun for them is that we get to run together, and because of the way the course is designed, I can actually stay with them while they run flat out. My redbone mix gets 1/3 to 1/2 of each meal in a bowl. The rest of his morning meal he gets during training and walks. The rest of the evening meal is for games/training or in an interactive toy. He’s gotten very quick at emptying Kongs, even when frozen solid – they lasted over 30 min. at first and now only last about 15 min. We also have the Busy Buddy and the Amaze-A-Ball. He seems to enjoy all of these, but they are not very challenging – they are a task that he readily completes because rewards are involved. And generally, he would always rather be doing something than nothing. I think Jennifer has it right – in the moment, he might go for the easy kibble first, but he will have more pleasure in total from the toy than if he just got the kibble in a bowl and wolfed it down. In fact, if I put the loaded ball plus the extra kibble all in his dish, the first time he tried to eat the loose kibble from around the ball. Now he removes the ball right away, sometimes working the ball first and sometimes eating from the bowl first. In good weather, I have also scattered a cup full of kibble over the back yard and he is perfectly content to find it piece by piece (the first time I read about doing this, it seemed mean or demeaning, but he loves “find it” and doesn’t see it that way). We recently got the Tug-a-Jug after reading mixed reviews. Had tried an empty soda bottle with kibble, but he interpreted it as a chew toy. The Tug-a-Jug was definitely frustrating for him initally (and he tried the chewing approach, which I kept trying to interrupt). The scent holes at the “wrong” end were a complete distraction. I took the rope out and that resulted in a puzzle that was about the right level of difficulty. I guess he can work up to the complete jug with rope. I’ve tried loading a Kong dental stick with peanut butter and cheese, or liverwurst. He usually loses interest quickly and I end up cleaning most of it out with a knife. 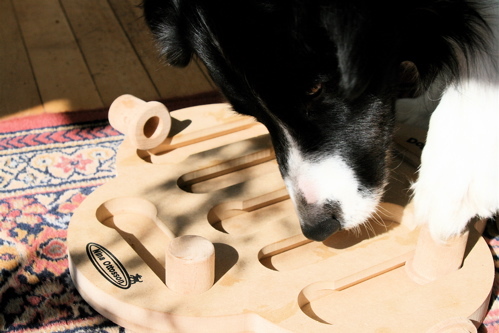 I have looked at the Ottoson and Canine Genius puzzles and may purchase them in the future when he needs a new challenge – nice to hear others’ experiences and recommendations. Any experiences with the Kong Stuff-a-Ball? I wonder if how they approach food may be related to how much they enjoy these puzzles. Certainly, neither of my dogs would pay attention to the Dog Fighter unless there were food involved. I don’t see that as a fault of the toy or indicative of whether they enjoy it or not. I like to play games and “unlock” levels or the mystery phrase, I’m sure Otttoson’s toys evoke something similar for dogs. That seeking behavior and all, right? I have two dogs: one with a high frustration tolerance (Jack) and one with a low tolerance (Sara). This is true across all food-reward activities. Jack will work on one task a lot longer than Sara will. I have to watch her closely when I’m teaching a new activity so I don’t frustrate and lose her. That said, she does love to play these kinds of games, but only to a certain point. And the Dog Fighter is beyond that point. Jack, on the other hand, will play with the Dog Fighter till it’s done (which is usually about 2 minutes max). He also seems content to play it over and over again if I’ll fill it for him. To answer your question, I think their reaction is more like “Oh boy, here comes the fun [and the tasty treats]” based on my personal experience. The only times I’ve seen ours get just a bit frustrated is when I make him stay at some place and hide a stinky treat somewhere in the house, then release him to find it. If he doesn’t find it within the first 30 seconds sometimes he sits and sighs loudly like “what the…. now WHERE did you put it? ?” 🙂 Then keeps looking for it. BTW, that looks like a really cool toy… I’m looking at their website and they have all kinds of interesting stuff. I totally remember the frustrated look on Milo’s face the first time we tried puzzles with him, but once he cracked that nut, he has always been seemingly excited when we bring them out. Milo will completely ignore dry food in his bowl and eat all his dry food from his inactive toys. And when the puzzle comes out we can’t just do it once…it has to be at least twice. Milo is a terrier, so interactive toys and puzzles are a must to a tired terrier. Here’s a question. My little guy has zero interest in a stuffed kong. I sometimes do the kibble “broadcast” and sprinkle his tiny kibbles around in a couple rooms. Find it! This has a downside in that some bitty thing ends up under some piece of furniture, which he eventually finds and then barks until I retrieve it. The ones under the dryer are lost forever but he still lets me know they are there. Endlessly. Anyway… do any of the interactive meal dispensers work with tiny kibble? His stuff is smaller than a pencil eraser and sliced thinner. Our Jasmine is an extremely smart girl. She knows what we’re thinking before we’re even thinking it. Interactive toys? I think that to her that is just nonsense. She surely doesn’t see any benefit in working this hard for her food. She does like solving problems. That part is cool. But once the problem is solved, why should she have to keep working at it? Same with marrow bones. Hey, why struggle if those by-peds have thumbs and tools! So with her and interactive toys it is one of two things. Either it’s too easy or it’s too hard and why bother. Her dog, J.D. liked his interactive toys for some time, but also got bored of working for food. On the other hand, I gave a friend one of these as a x-mas present for Jasmine’s buddy. He loved it so much, that he didn’t want his food served any other way. I have to tell you this… as I was sitting on the couch with my lap top reading your post about not thinking Willie as imitating your action when I noticed the cursor moving on the screen I looked down and my 6 month old corgi Penny was moving her paw on the touch pad mouse!!! I had been on the couch with Penny beside me for about 10 minutes, no typing just surfing and reading e-mail was she copying my actions? … if I teach her to type maybe she could get some gainful employment!!! MJ: Have you seen the “Mini Leo” by Canine Genuis (http://www.caninegenius.com/)? Or the “Hi-Q” toy (http://www.hiqchallenge.com/)? I have the Hi-Q, and I think the holes (star-shaped) are perhaps less than 1cm diameter. The ends are wider, so lots of kibble would spill out there, but perhaps you could plug it with something (tape?)? With each of these toys, you can link multiples together to increase complexity. My GSD gets ~80% of his meals from a food-dispensing toy. He also has to “find it” somewhere in the house. I think he likes trying to find it, but I wonder if he views “working” for his dinner as…well, work, and not really “play”. I think he’d rather snarf it right out of the bowl, so I try to be enthusiastic while filling the toy, and while he’s “working” it. His level of hunger determines how hard he’ll work. I bought the Nina Ottosson “Dog Casino” as something we could learn together over the winter (with their high price tag, I don’t want him to master it right away 😉 ). He’s not a chewer at all – if there are no treats in the toys, he doesn’t touch them. His favourite thing is a game of chase, so we’re teaching him the names of his toys, hiding them in the house for him to find; after he finds it, we play chase (with lots of switching the role of chaser). One Kong variation I’m going to try (I read this on dogstardaily.com): Threading a thin rope through a Kong, putting a knot outside the end with the small hole, and hanging the Kong upside-down, filled with kibble. Increase the difficulty by increasing the height (I guess start it very low to the ground). Other toys we bought to help pass time on bitterly cold nights: “bowling” using a child’s bowling set (no chewing anything; who knows what’s in those toys), and “basketball”. I have not tried the interactive toys. I do feed my boys at least one meal a day in their kongs, just to make it seem more interesting and last longer. They love it. I more wanted to respond to your comment about that look of frustration, especially when shaping. My little pit bull loves shaping exercises. If i get the clicker out his eyes light up and he dances and prances. Sometimes we even have to chill out a little bit before he can do anything or he’s too spazzy. He does make the “seriously, whaddaya want lady?” face at me sometimes, which reminds me to click more often for more minute advances towards whatever the goal may be. But the best part of it is that it seems to me like that frustration we work through does two awesome things for us. 1) It spawns innovation. He gets annoyed and tries something new. And once he gets over the hurdle of a new thing, it’s in his repertoire forever. He looks so dang proud when I click for it. Wonderful Topic! i own 2 different kinds of Aussies, but both are fed dinner with Work for Food type toys. Simon – my food motivated boy – is an insatiable problem solving machine. Molly will do Work for Food type things, but kibble isn’t her favorite food and Kongs aren’t big enough to hold all her dinner. She pushes around the Tricky Treat Ball with a bit of disdain, but it’s important to me during my long workweek that they get some mental exercise every day. Simon, OTOH has discovered that he can more easily get the kibble out of the TugAJug if he can prop it up on the side of his crate. At meal time, I have an Xlarge Tug a Jug in one hand and a Treatball in the other. Simon very carefully takes the TugAJub by the ‘rope’ and disappears into his crate for his daily routine of putting his mouth around the end that doesn’t open and shaking, tugging on the ‘rope’ and nosing it against the side of the crate so the food comes out the opening. I’ve been thinking about giving him Molly’s significantly smaller Jug as the food is harder to get out when it’s packed tighter. Molly messed with it for 5 minutes and then looked at me with absolute disdain. I’m also collecting small sized Kongs so Molly can eat happily unchallenged in the crate and Simon can hunt around the house for hidden ‘eggs’. Best of luck with shearing. Watching the welsh shearers is fascinating if you get the opportunity! Ohmigosh, your posts are all so fascinating! I love this blog. So many topics! I can’t comment on the interactive toys – I have never tried them. I typically use the stuffed kong (kibble along with frozen pbutter to seal it all in and make it last longer – I sometimes sub cream cheese or canned dog food) and marrow bones as my go to’s (when I leave the house). I have used a Buster Cube but the darn thing is so loud, I don’t use it often (I work from home so having the dogs crashing the cube around is a bit distracting). I like the look of the interactive toys but not the price and wonder if I’d truly use them since most of my “distraction” needs are when I’m not home. I’m fortunate in that I can take the dogs out during the day for a quick fetch game, short training session/find it game or a short leash walk to break up the day vs needing an interactive toy. However, in terms of topics I have a few – one thing I think of often is why I feel like leashed walks just aren’t enough for my dogs. I feel like they are only sufficiently exercised when they are walked offleash. Are invisible/electric fences ethical? Are they detremintal to a dog’s psyche or are they just another tool that when well used (ie dog well trained and set up for success) can actually be beneficial for those who can’t have a physical containment (true fence) for their dogs? (this one I’m sure is a touchy subject especially in a “positive training” blog!! 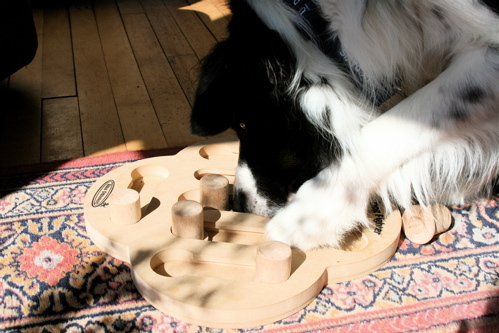 Because I have two young border collies in the house, I am using my food puzzle toys a lot. I have used a variety of food puzzle toys over the years, primarily Kong, Canine Genus Leo and some of the Busy Buddy line. My older dogs never were able (or interested enough) to master the rope and jug toy that Busy Buddy developed and so mine just gathered dust in a basket. The border collie puppies, however, got that one down in about 10 minutes. They have their preferences though–Shaina will stay at the rope and paw at it, while Larkin wait to scarf up the kibble from all his sister’s effort. I need to put them in separate crates with two toys for him to work it himself. Usually I give these after a period of intense activity–then I give the toys in their crates and the puppies work on them until they fall asleep–and the rest of the household breathes a sigh of relief. But I think your question really was about whether it was beneficial or aversive to feel the frustration of trying to get your food by a more difficult route. Years ago (longer ago than I care to admit) I did a summer training program at the Portland Zoo with Dr. Hal Markowitz. Dr. Markowitz had a program where he would develop feeding paradigms for the zoo animals that emulated their natural behaviors. For example, he had an apparatus set up that would give a bit of food after the gibbon had pulled two levers which were on opposite corners of the cage. This got the gibbons brachiating around their cage instead of sitting all day. He and his students set up a number of interesting behavioral stations around the zoo. One interesting thing was that the zoo animals were never held off food. They would operate these food dispensing machines all day while bowls of tasty food sat on the floor of their cage (in addition they were in better physical condition, aggression was reduced and a number of other benefits came out of it). But it really made an impression on me looking at the bowls of food sitting there while the gibbons flew through the air racing each other to the lever that dispensed food. It would be hubris to assume that I knew what was going on in their minds, but it was obvious that the earned food was of higher value. Now a similar thing would probably not happen with our domestic dogs, who apply a “feast or famine” mentality to food and would likely eat everything in the bowl and then get what they can get from the machine. But it is interesting to consider whether the earned food also has higher value for them. Now if I might interject some human observations into this but it seems to me that frustration is an emotion that is positive or negative depending on the intensity and duration and whether anything comes out of it. Finally accomplishing something after enduring frustration to reach a goal produces a great feeling of relief that is very rewarding. It seems that this is very beneficial in an ethological sense as well. When attempting something, frustration will build up and eventually cause you to stop trying to accomplish something that is just burning up your energy with no benefit. But if you succeed from your attempts, the relief from frustration is rewarding, causing you to try for that reward again. You learn to experience frustration and still keep trying for a solution. And experiencing some frustration before you succeed is a way to build in resilience. I think that developing emotional resilience is often overlooked but highly advantageous to survival. It keeps organisms from falling apart when experiencing difficulty. Think of the song High Hopes (Oops there goes a billion kilowatt dam). Without frustration building resilience, organisms would melt like tissue when facing a challenge, including life threatening ones. Perhaps this is the best benefit that our pets get from food puzzles rather than the intellectual benefits–experiencing measured amounts of surmountable frustration helps them to build emotional resilience, which then goes on to benefit the animal in many ways and diverse circumstances. …and would appreciate your thoughts and feedback on the approach suggested to alleviating dog-dog aggression in the situation described. The solution proposed in the article doesn’t appeal to me because it seems to allow one of the dogs in the pack to have its dominance over the other dog/s reinforced. My thinking has been that if the human is established as the leader of the pack then the human ought to be able to greet any dog in the pack when it suits the human, not merely in the way that pleases the heirarchy-conscious-alpha-wanna-be dog. I understand that if dogs are ‘jealous’ it’s appealing to solve the issue by taking the “don’t rock the boat” approach suggested in the article but it just doesn’t sit well with me. I’m willing to modify my thinking though if more compelling information comes my way, which is why I’m suggesting it as a topic! I’m just going to contribute this little piece of anecdata: My dog is a rescue with serious trust and behavior issues, and as a result, she is frequently hand-fed and given food and treats out of toys. Sometimes, when I’m in a hurry, I’ll just put the food in her bowl, and she won’t eat it. She’ll go all day and maybe have a piece or two but just sniff and ignore. But if I come back later, pick up that same kibble, and put it in a toy, she’s on that like white on rice. (and I don’t think it’s a bowl issue, she eats other things out of the bowl no problem, just not plain kibble.) It seems like unearned food doesn’t hold much value for her; she’d much rather be working for it, as it were. And she really seems to enjoy getting it out of the toys–she doesn’t display NEARLY as much interest in the food canister as she does in the toys themselves. It’s really interesting. Working for food appears to be fun for Sparky the Portie. He is food obsessed and will happily work any toy until every morsel has come out. Ronja the Hound, is not very food motivated and easily bored. So, unless I get her in one of her very playful moods, she will give it one or two half-hearted tries and then shoot me that very disapproving “gee -how stupid is this!” look and walk out of the room. Much to Sparky’s delight, who now will get her treats, too. Off topic: Jana, I so agree with the acupuncture article on your blog. Sparky is 15 and has lost most of the use of his hind legs due to his back giving out. Acupuncture has been invaluable to keep (actually improve) the strength he has left for walking in a sling and to keep him relatively pain free. My vet (who is not the acupuncturist) thinks that it works better than any pharmaceutical. I’d like to know the difference between relationship, leadership, and dominance — and how it all relates together in an interspecies relationship. I love the way clicker training reveals a dog’s thought process. If you start really shaping a dog you have known a while, rather than just lure/click/reward, you find out things about them that you never see otherwise. And if looks could kill- when they think they have earned a click did not get one. Not only that but I learned that Pepper counts. She is a 6 month old Aussie. She’d nose her lid target, once, click, and not come to me for her treat but instead nose it again, another click. Then she would come to me and I gave her one treat- then she would stand there giving me such a look that I knew she was waiting for the second treat for the other click. If I had only clicked once she wouldn’t stand there looking and waiting. I have a couple Ottoson toys as well. As many have mentioned, my dog too figured it out rather quickly, but I love making the puzzle more difficult. For example with the smart box, I’ll put a wooden cube up on a chair, table several feet away and ask my dog to go retrieve it and calmly put it in the box. He then gets the food reinforcer from me. So, I guess… we can make it as creative as we want for the dog too. Another one of those gadgets that I say … “now why didn’t I think of that?” Even though I’m not a fan of flexi-leadss- it’s a great invention for many dogs. It’s just great that so many people are creating puzzles and ways to make problem solving fun for our dogs. I bought the Dog Fighter toy for my Cattle Dog mix hoping to keep her mentally occupied during the winter. I bought that one because it seemed like it had the most options for increasing difficulty. Little did I expect her to run through all variations I could think of in her first attempt with the puzzle! Still, she loves to use it. My dog is only medium motivated by food. She definitely sees treats as a reward, but doesn’t obsess on over them. She frequently leaves her Tricky Treat Ball half-ful. With Dog Fighter, she really seems to enjoy figuring out the puzzle each time. I try and vary what I’m doing to keep it interesting–I put a treat under all the cups, stack 2 cups and a larger locking cup in one slider, then have a treat in only one cup in the combo. She enjoys each variation and watches very carefully as I set the board up. I’ve also put all the cups out and had only one treat on the board. She figures this out when the first cup doesn’t yield any treats and uses her nose to find the cup with the treat–and then proceeds to remove all the empty cups anyway. I’ve seen my dog get frustrated–trying to figure out Tricky Treat Ball, for example. But the Ottosson puzzle she really seems to enjoy for it’s interactive qualities. I figure even if it isn’t the challenge I thought it might be, as long as she is enjoying herself, that’s what counts. my dog dislikes going outside into the rain. If I suggest going out, she may stand near the open door looking out for a moment, then back up, look at me with an exaggerated shake, then slink off under the table. So, is it just reflex, or is she thinking of how it feels to be wet? I am one of those who was very excited when I first learnt about interactive toys. We have two rescue dogs – Minnie is a border collie/shepherd mix and Mickey is a rough collie/golden mix. Minnie has been with us longest and she was always smart. I had kongs with her, tug a jug etc. no matter how difficult I made the stuffing in kongs, she would patiently lick it through. She figured out tug a jug much faster than I thought she would. She seems to have tons of patience in figuring out the puzzles and seem to be exhausted after she is done. But after a few times she seems to lose the same excitement. Mickey, on the other hand, has no patience and he doesn’t quite appreciate the concept of working for food:) He actually doesn’t play any games at all. I am desperately trying to get him interested in playing something so he can burn some of his energy off and we can get closer to each other. So far no luck – he has reactivity issues also. On the other hand, he is very agile and seems to understand shaping. I would like to try more puzzle toys with Minnie. I wonder if these puzzle games are for dogs what a video game is for humans. I am serious, play a video game for a while and get to a level that you just cant get past. You are totally frustrated but it does not matter you are up until 4am determined to get past it. Once you do you are so satisfied with yourself. The down side is that you play that level a few more times and now you know all the short cuts you lose interest. You are ready for the next level that produces the same amount of frustration as the previous one. The question here is it same for dogs? Do they eventually get tired of a game that is now too easy? Perhaps for some dogs the frustration is half the fun much like a video gamer trying to figure out the difficult level.